Due to manufacturer's restrictions we are unable to ship Mountain Hardwear products to Great Britain. Unique Lamina construction maximizes the loft of your insulation, eliminates cold spots and thermally maps insulation to areas you need the most warmth. By strategically placing insulation, we are able to concentrate warmth where you need it most - around your core and feet. The Lamina Z Sleeping Bag is made with a proprietary welded Lamina construction. This enhances loft and creates a fuller space for heat to be trapped inside. By using laminated construction, the insulation is welded instead of stitched which will prevent cold spots and create a much warmer environment. This way you don't have to sacrifice the warmth for a lighter weight bag. The insulation is specifically zoned to key areas which maximise warmth in key areas which feel the cold more such as the core and feet. ThermalQ insulation has been specifically chosen as it maintains excellent loft and has outstanding compressibility. By trapping and holding heat the insulation works to provide warmth straight out of the bag and holds it throughout the night. 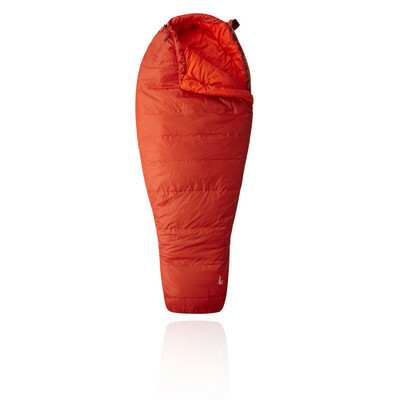 It ensures the highest warmth to weight ratio making for a lightweight, manageable sleeping bag. A durable, lightweight nylon shell works to repel water ensuring added weather protection whilst a soft polyester lining wicks away moisture ensuring you remain cool, dry and comfortable at all times. The Laminina Sleeping Bag's comfort mummy cut is snug for added warmth; it maximises warmth and fit whilst minimising weight. A full-length zip has been added to the front of the sleeping bag which allows the user to quickly and easily adjust the fastening when they are in or out of the bag. Dual sliders have also been added to the zip which minimises weight but still allows the wearer to adjust the fastening and provides ventilation when it is needed. A down-filled face gasket comfortably blocks drafts at the opening of the hood to keep you protected and reduce any wind chill. The comfort footbox allows natural foot position to bolster comfort, and prevent the feeling of being restricted which may lead to injury or discomfort. A zippered pocket at the shoulder provides accessible storage for small essentials. Lastly, a nylon compression sack and mesh storage sack are included so that you can compress and carry your sleeping bag with ease over long hikes or treks. Mountain Hardwear was founded in 1993 by a small band of outdoor industry iconoclasts. They saw the industry changing, compromising quality and dumbing down products to serve less technical users. Mountain Hardwear was founded to buck this trend in order to stay true to the needs of outdoor athletes. Over the last 20 years, Mountain Hardwear's independence and willingness to do things differently has driven innovation in outdoor apparel and equipment. Performance means products purposefully designed, form following function, using the highest quality materials and technologies. Performance means providing users with better physical and emotional experiences through fit, weather protection, temperature regulation and moisture management. Mountain Hardwear believes everyone who enjoys the outdoors is an outdoor athlete. From 8,000 metre climbers to weekend day-hikers, we all aspire to better physical experiences in the outdoors. Since the first parkas, Mountain Hardwear delivered in 1994 to the award-winning Ghost Whisperer Down Jacket of today, they have focused on empowering athletes with equipment and apparel designed to help them maximise their performance and their enjoyment of the outdoors. Welded Lamina Construction - Prevents cold spots and enhances loft. Zoned Insulation - Maximises warmth in key areas of the bag. Thermal Q - Insulation which is excellent for compressing and maintains loft. Nylon Shell - Repels water ensuring ample weather protection. Polyester Lining - Wicks sweat to keep you warm and dry. Performance Mummy Fit - Cut snug for maximum warmth and minimum weight. Full Length Zip - Ensures quick and easy adjustments. Dual Zip Sliders - Minimises weight and allows for adjustment and ventilation. Down-filled Face Gasket - Comfortably blocks drafts at hood opening. Comfort Footbox - Follows natural food position for maximum comfort. Zippered Pocket - Provides safe storage for essential items. Nylon Compression Sack and Mesh Storage Sack - For easy, lightweight and convenient storage on the go. Weight - 2 lb 1.9 oz / 960 g.
Bag Shape - Comfort Mummy Cut. Bag Loft - 3 in / 8 cm. EN Rating - T-COMFORT: 42 F / 6 C.
EN Rating - T-LIMIT: 34 F / 1 C.
EN Rating - T-EXTREME: 6 F / -14 C.
Bag Stuffed Size - 6 in / 15 cm x 12 in / 30 cm. Hip Girth - 64 in / 163 cm. Shoulder Girth - 65 in / 165 cm. Foot Girth - 43 in / 109 cm.